From left; Govs. 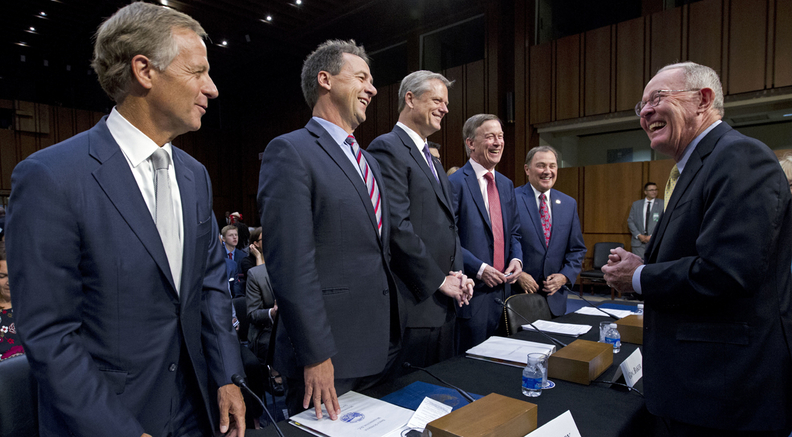 Bill Haslam of Tennessee, Steve Bullock of Montana, Charlie Baker of Massachusetts, John Hickenlooper of Colorado and Gary Herbert of Utah are greeted by Senate Health, Education, Labor, and Pensions Committee Chairman Sen. Lamar Alexander, R-Tenn., right, during a hearing to discuss ways to stabilize health insurance markets, on Capitol Hill. For nearly a year, health insurers have operated under a cloud of political and regulatory uncertainty that has taken a toll on finances, and for some, their day-to-day operations. Even though Congress shifted its focus from bulldozing the Affordable Care Act to stabilizing the troubled individual market in the short term, big questions remain, particularly around future funding for cost-sharing reduction subsidies that insurers say are crucial to steadying that business line. The Senate Health, Education, Labor and Pensions Committee last week held hearings on how to shore up the individual market in hopes of passing a bill by Sept. 15; that's so a law can be signed before Sept. 27, when insurers in many states must finalize if, where and for how much they'll sell coverage. Senate Democrats, state insurance commissioners, and a group of GOP and Democratic governors urged Senate Republicans to guarantee cost-sharing reduction subsidies for at least two years. Lawmakers hope to pass bipartisan legislation to steady the individual insurance market, but health plan officials aren't optimistic that a solution will come in time for them to make strategic business decisions. Those subsidies help lower the out-of-pocket costs for consumers with incomes below 250% of the federal poverty level. Without them, insurers will likely hike rates by as much as 20%, or stop offering coverage on the exchanges altogether. Some states are publicly releasing approved 2018 rates, while others are waiting for a signal from the Trump administration that it will pay the subsidies through next year. The notion of funding the cost-sharing reduction subsidies is gaining momentum. Sen. Lisa Murkowski (R-Alaska), a swing vote who helped kill a partial repeal of the ACA, said what matters when it comes to appropriating money for the subsidies is that both parties agree it should be done. "Whether it's one year, two years or perhaps longer, we can figure that out," she said. Republican lawmakers stressed the need to provide states with more flexibility for 1332 waivers, and the changes they are discussing do not affect consumer protections. State commissioners and governors also called for the return of federal reinsurance funding, at least until states could design their own programs. Despite what some observers view as progress toward a bipartisan solution, health plan executives are uncertain that lawmakers will come up with a solution in time for them to make decisions about participating on the public insurance exchanges. "At the moment, there is not a tolerance in Congress for this kind of thing," said Chet Burrell, CEO of major marketplace insurer CareFirst, of the potential for a federal reinsurance program. Burrell, whose company sells coverage in Maryland, Washington, D.C., and Northern Virginia, said he's not optimistic that Congress will stabilize the insurance market. Instead of waiting for a lifeline that may not come, health plans and state regulators have taken matters into their own hands by making sure plans are available in counties in danger of having no insurance options for next year and ramping up outreach for enrollment even as the federal government undermines the exchanges. They secured what seemed like their first victory when Dayton, Ohio-based insurer CareSource volunteered to offer coverage in the final U.S. county in danger of having no marketplace insurers in 2018. That triumph proved short-lived when insurer Optima Health announced Wednesday it would reduce its presence in Virginia, leaving 48 counties and 15 administratively independent cities and towns without any exchange insurer and sending the state's regulators back to the drawing board. Optima's withdrawal highlighted the fragile state of the individual market, which covers some 20 million individuals. Several large insurers, including Aetna, have exited the exchanges completely. Anthem, one of the dominant exchange insurers this year, continues its slow retreat. And two insurers—Northwell Health's CareConnect and Maryland co-operative Evergreen Health—are winding down operations. Both blamed the federal government's failure to correct flaws in the healthcare law. It's important to note that a few other insurers, including Centene Corp. and Oscar Health, are actually expanding their footprints in the exchanges. Other insurers maintain that they could pull out of the marketplace if important questions about the future funding of cost-sharing reduction subsidies and the individual coverage mandate remain unanswered. Dan Hilferty, CEO of Philadelphia-based Independence Blue Cross and chairman of the Blue Cross and Blue Shield Association, warned that Independence may only offer off-exchange individual products in 2018 if the subsidies ultimately go unfunded. "At the end of September, we need to make a commitment," he said. "We don't take lightly the possibility of not offering products through the exchange in 2018." Matters have grown more complicated since the CMS announced it would slash funding for marketing and outreach during the shortened HealthCare.gov open enrollment that kicks off on Nov. 1 and ends Dec. 15. The federal government will spend just $10 million on advertising and outreach to promote enrollment in the 39 state exchanges using HealthCare.gov, down from $100 million budgeted by the Obama administration last year. "The people that the ACA sought to reach really need the coverage, and anything that hides it makes it more difficult to get the coverage. I believe it's counterproductive," said CareFirst's Burrell, calling the funding cut akin to "sabotage." Some health plans and at least one state-run exchange are ramping up their own marketing campaigns to make up for the uncertainty at the federal level. California's exchange has devoted an extra $5 million to its marketing budget, bringing the total to $111 million—a figure that dwarfs what the federal government is spending for the state exchanges using HealthCare.gov. Other plans can't afford to spend any extra money on outreach when they are already losing millions from the policies they sell on exchanges. "It's very unclear where the additional marketing resources would come from," said Kristine Grow, a spokeswoman for trade group America's Health Insurance Plans. One element in consideration for the quick-fix bill is to open up catastrophic plans, also known as "copper" plans to buyers 30 and older. Currently, those plans are not eligible for subsidies and are not part of the larger risk pool. If they are merged with the total risk pool, it would make copper premiums more costly, but might still bring more healthy customers into the system. Lingering questions create more work for insurers. Consumers are calling them, asking whether they'll be able to afford their coverage in 2018, said Ceci Connolly, CEO of the Alliance of Community Health Plans, which represents community-based not-for-profit insurers. Actuaries are having to run more scenarios. 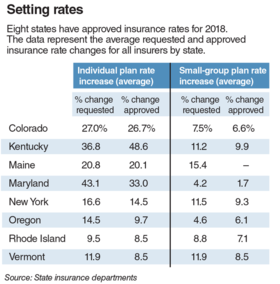 Many states required insurers to submit two sets of rates—one set assuming cost-sharing subsidies will be funded, and one assuming they won't. And because plans are "in crisis mode most of the time," they are unable to focus on big-picture initiatives, such as population health, she said. While recent congressional attention has been devoted to stabilizing the individual market, insurers are also concerned about the future of Medicaid, fearing reimbursement rates will be squeezed going forward. "We are trying to improve the efficiency and performance of the plan on the administrative side so we will have more dollars available for providers, because if there are further rate reductions, providers will start to say, I can't deal with Medicaid patients anymore," said John Baackes, CEO of L.A. Care Health Plan, which insures 25,000 exchange members and serves more than 2 million Medicaid members. Those efforts include direct-contracting with local physicians and beefing up care programs for complex patients who use a lot of healthcare resources. "Eventually, whether you are committed to repeal and replace or fix the ACA, Congress needs to come together to come up with a viable path forward," Hilferty said. The focus should turn to "ways to make (healthcare) sustainable, ways to engage providers and make them move to a value-based system, and get our hands around pharmaceutical costs. This partisan divide that has grown in the halls of Congress and the halls of our state legislatures needs to be bridged."